We have been at the beach this week. It’s been cool in the days and windy at night–and I haven’t caught a single fish. We are usually down here on the Gulf when the water is warmer and can pretty much count on a lunch’s worth of whiting, and with any luck, flounder, black drum, redfish, and the occasional pompano (if our timing is right). And of course, Fish Head soup. But on this trip: nothing. And how can you make fishhead soup if you haven’t caught a single fish? That’s when Josh got the idea to make coquina broth. The night before, he had been looking through a shell book with his grandmother, trying to identify what turned out to be a fighting conch shell. Flipping through the pages, he stumbled upon a full-page spread on coquina, with a sidebar describing coquina broth. 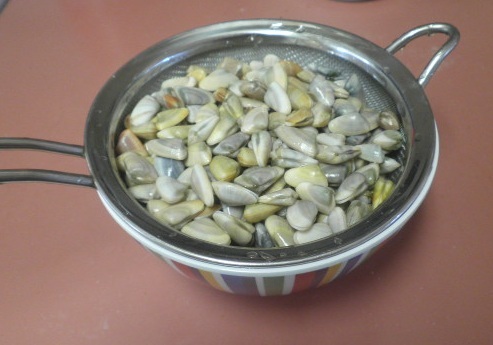 It wasn’t much of a recipe–something along the lines of: rinse the coquina, pick out the dead ones, and boil. He couldn’t wait to show it to me. There’s a back story here–Josh had asked me last year about coquinas, wondering if it were possible to use them in a chowder. I expressed my doubts. Now here was proof-positive that someone, somewhere had deemed these little critters foodworthy. So, what’s a coquina? They are these tiny bivalves, about an inch long and a quarter inch wide. They have beautiful shells tinged blue, purple, pink, or yellow. They are fast diggers (I leave you to search YouTube for proof). And, apparently, they make a very yummy broth. Heat your olive oil and add your garlic. Saute for a few seconds, then add your tomato and salt. Cook for a couple of minutes until the tomatoes start to break down. 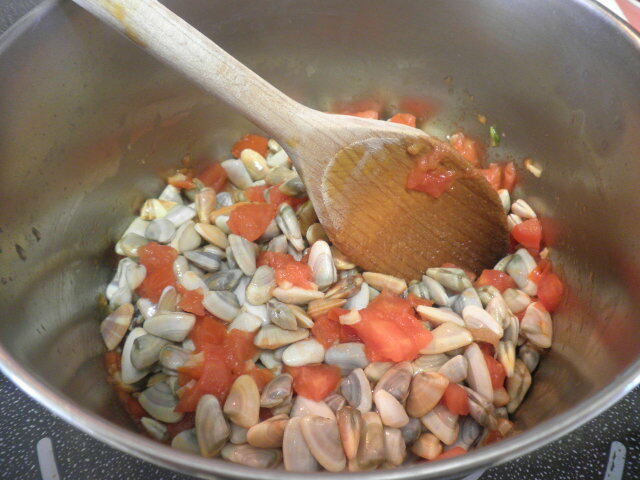 Add the coquinas and simmer until the shells start to open. Add water and raise the heat to high. Once your liquid gets close to a boil, lower your heat and simmer for 20 minutes. There’s really not much meat inside those shells. We all tried a nibble and none of us thought much of trying to make a meal of those morsels. The broth, however–that’s a different story. There’s a surprising amount of flavor packed in those little fellas. I can’t imagine any of you running out to make this dish (can you buy coquina?) but hey–next time you’re playing in the sand…who knows? Maybe a cup of coquina broth isn’t your thing, but I could definitely see using this stuff as a very tasty base for a pasta or rice dish. Plus, any meal that the kids can see go from ocean to table is a good one in my book. This entry was posted in Uncategorized and tagged experiments, seafood, soups. Bookmark the permalink. Coquina broth makes a fantastic base for risotto, my 8-year-old’s favorite beach food. I agree! Here’s our second coquina experiment, which involves rice. Just watch out for those shells! We were just talking about coquina soup this weekend at the beach. My mother remembers her Grandmother making coquina soup when she was a little girl. It was cream and butter based soup. I googled coquina soup and found your recipe. This will be fun to try on our next beach trip. Oh wow! In my country these are called chip chip. I remember these from my childhood. We would dig these up and cook them. Lots of work to clean the sand out of them. Thanks for the trip down memory lane. I wonder why “chip chip”–from the sound of them working themselves back in the wet sand? I grew up around ft. myers in the 50’s and 60’s. 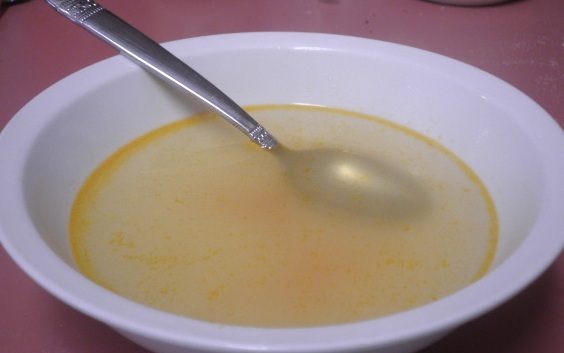 We often made coquina broth. The old timers built screens of any square box shape and covered the open portion with hardware cloth wire. They shoveled sand containing coquinas into the screen and washed it in sea water to remove the sand. Pick out any shells and debris and transport the coquinas in a bucket of seawater to keep them alive. boil at home. drink the broth with a little butter and feed the shells and meat to the chickens.